Freezer Meals are wonderful to have on hand, but cooking in the kitchen for hours by myself is not my idea of a fun day. 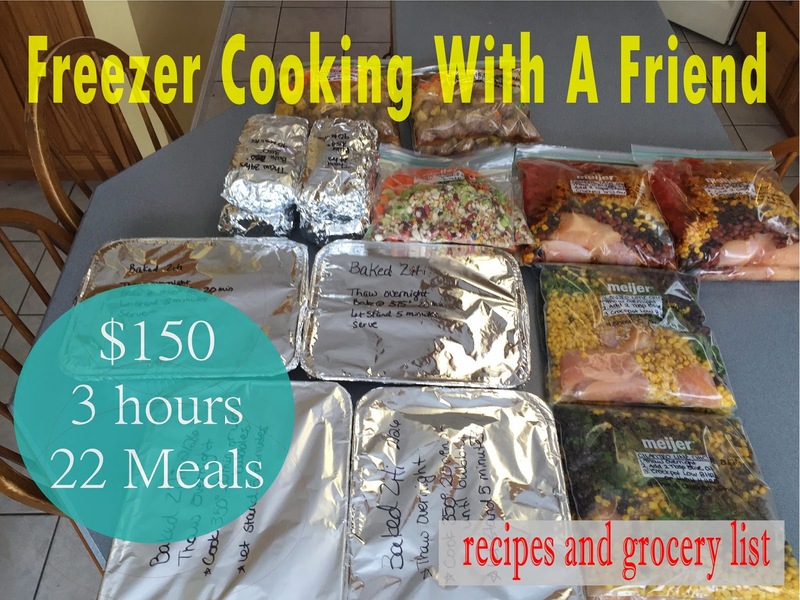 If you are new to freezer cooking, or if the idea of being in a kitchen for 2 to 3 hours overwhelms you, pick a cooking buddy! Cooking with a friend gives me motivation to plan, we share the work load of prep and dishes, and I get to spend time with a person I love! What could be better?! Thankfully I have a great friend with a big kitchen, and we had such a fun time during our Freezer Prep Party, round one that we did a Round Two! Pick a friend who has similar foods needs. We both have families of four. Even though she has teens and I have seven year old boys, the meal sizes needed are about the same. I would say picking just one freezer friend, maybe two. Anymore than that will be "too many cooks in the kitchen", with just too much food to prep. Divide up responsibilities before shopping, like who will host and how to divide up costs and shopping. She hosts in her bigger kitchen, and I do all the shopping. If you want divide up shopping, you can each print the grocery list and buy your own share of the ingredients. Another option would be dividing up the groceries by type,with one friend buying produce and frozen, and the other buying meat and dry ingredients, etc. If either of you have a membership to Sam's or Costco, I highly recommend that friend buying the meat. Below are the six recipes we used. We made four of each of the recipes listed below, giving us both with two of each recipes, 12 meals total to take home. The total for all 22 meals was about $150, which is $6.25 a meal (each of paid $75 for 12 meals). Many of the meals are very large, and can be counted as two meals when you include the leftovers. 1. Cut ALL meat and vegetables first, store in bowls in fridge for quicker assembly later on. 2. Write labels on all bags before beginning. 3. Assemble the recipes that involve cooking first. We did Baked Ziti first, it definitely takes the longest by far. It would have been discouraging to do that one last when we were all out of steam. 4. Assemble recipes one at a time. Printables: Each printable includes two lists for single and double batches. 1. Heat olive oil in a pot over medium heat. Add onions and garlic and sauté for several minutes, or until starting to soften. 2. Add Italian sausage and cook until browned. Drain off fat if any, leaving a bit behind for flavor and moisture. 3. Add Spaghetti Sauce, stewed tomatoes. salt, pepper, and Italian seasoning to pan with Italian Sausage. Stir and simmer for 5 to 10 minutes. After that time, remove 2 cups of the sauce to a different bowl to cool down. 4. In a separate bowl, mix together the ricotta cheese, 1 1/2 cups of the mozzarella, Parmesan, egg, and salt and pepper. Stir together just a couple of times (do not mix completely). 6. Add the cooled meat sauce to past/cheese mixture and toss to combine. 7. Add half the pasta mixture to a 9x13 disposable dish. Spoon half of the remaining tomato sauce over the top, then top with half the remaining mozzarella cheese. Repeat with another layer of the coated pasta, the sauce, and the mozzarella cheese. To Freeze: Cover with two layers of foil (to avoid freezer burn), label, and freeze. Used within 3 months. To serve-Bake for 20 minutes, 375 degree, or until bubbling. Remove from oven and let stand 5 minutes before serving. 2. Put contents of bag in Crockpot, and stir in 2 Tbsp of Olive oil. 3. Shred chicken in crock pot once cooking is done. Top with sour cream, shredded cheddar cheese, and/or tortilla chips. It was a bit too spicy for my kids, so when I made it again I subbed another can of tomatoes for the rotel, and only used HALF a package of taco seasoning. This recipe makes one 2 pound loaf- the picture has two loaves, because doubled the recipe. 1. Thaw in fridge for at least 24 hours. 2. Bake at 350 degrees for 60 to 80 min, or until cooked through. 3. Add topping of your choice half way through cooking (ketchup or BBQ sauce). 1. Label Gallon sized Freezer Bag. 2. Drain Pineapples, set juice aside. 3. Place meatballs, pineapples, carrots, pepper, and water chestnuts in bag. 4. Combine remaining ingredients in a small bowl and pour over meatballs. 5. Remove as much air as possible, freeze flat for up to 3 months. 1. Thaw in fridge overnight. 2. Place contents of bag in crockpot. Cover and cook on low for 6-8 hours or high for 3 to 4 hours. Combine ingredients in a gallon zip lock bag (minus the broth). 2. Add broth and bag to slow cooker. Cover and cook on low for 8 hours or on high for 4 to 5 hours. Makes one of each recipe (see printables above for doubled grocery list).